Commander of North American Aerospace Defense Command and U.S. Northern Command, Adm. Bill Gortney submitted an urgent need in April,2015 meant for AESA active electronically scanned array radars for F-16s around Washington DC. They have some boxes and the airplanes but they have to marry them up. The concern is the cruise missile threat. You need a system of systems in order to defend against cruise missiles. When it comes for the airborne piece of that, you need the capabilities that the AESA radar can give you to that. But it’s only a single piece. It’s also the JLENS (Joint Land Attack Cruise Missile Defense Elevated Netted Sensor System) that they are testing in Aberdeen (Proving Grounds, MD). They need to nest it with the naval Aegis that are off the coast so that they can track, and share data, and — and have our best opportunity to — to shoot down any of the leakers that might be out there. But the best way to defeat the cruise missile threat is to — is to shoot down the archer, or sink the archer, that’s out there. The Joint Land Attack Cruise Missile Defense Elevated Netted Sensor System, or JLENS, is an aerial detection system designed to track boats, ground vehicles, cruise missiles, manned and unmanned aircraft (Airborne early warning and control), and other threats. The system has four primary components: two tethered aerostats which utilize a helium/air mix, armored mooring stations, sophisticated radars, and a processing station designed to communicate with anti-missile and other ground and airborne systems. Each system is referred to as an “orbit,” and two orbits have been built. The Army-led joint program is designed to complement fixed-wing surveillance aircraft, saving money on crew, fuel, maintenance and other costs, and give military commanders advance warning to make decisions and provide notifications. 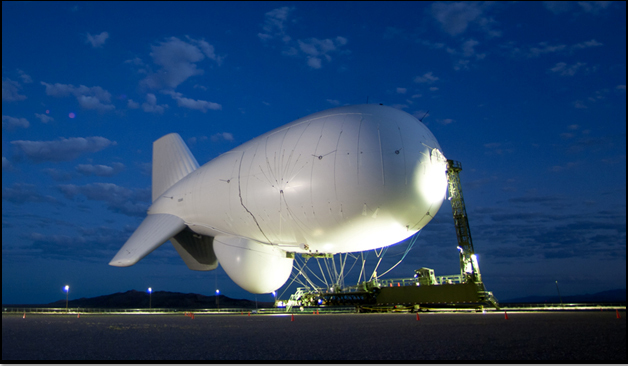 The system features two tethered aerostats, roughly 77 yards in length, that float to an altitude of 10,000 feet for up to 30 days at a time. Each aerostat utilizes a different radar system—one has a fire-control radar and the other a surveillance radar. JLENS is designed to provide 24/7, 360-degree coverage extending 340 miles, an area roughly equal to the size of Texas. Its detection capability seeks to equal to 4-5 fixed-wing aircraft, and is designed to operate at 15-20 percent of the cost of fixed-wing aircraft. The tethered cables relay data and provide power. As threats are detected, information is sent to anti-missile and other fire-control systems including Patriot, Standard Missile, Advanced Medium Range Air-to-Air Missile, and the National Advanced Surface-to-Air Missile System. Its relatively low-power usage and over-the-horizon capability makes it less expensive to operate than existing fixed-wing systems and provides significantly greater range than ground-based systems. JLENS aerostats are filled with 590,000 cubic feet of non-flammable helium. Each unit would cost about $175 million. The Pentagon is worried about the Russian KH-101 cruise missile. The long-range Kh 101 cruise missile apparently still under development by the Raduga Design Bureau and long-range aviation. It was apparently first launched in October of 1998 by a Tu-160 during 37th Air Army exercises. It will reportedly be employed with either a conventional (Kh-101) or a nuclear (Kh-102) warhead. The conventional warhead version required the use of a highly accurate guidance system, which reportedly provides a circular error probability of 12-20 meters. An electro-optic flight path correction system uses a terrain map stored in its onboard computer, as well as a TV-seeker for the terminal stage of flight. The Kh-101’s launch weight is 2,200-2,400kg and its maximum speed is Mach 0.77. The range of this system probably exceeds 3,000km, and some reports claim a range of as great as 5000 km.